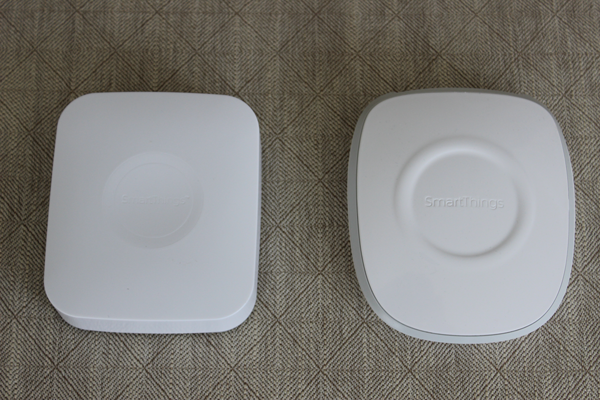 SmartThings Review: Version 2 Is Here, Should You Buy It? It took longer than promised, but SmartThings v2 is finally selling on both Amazon and SmartThings.com. Was it worth the wait? It took longer than promised, but SmartThings v2 is finally pre-selling on both Amazon and SmartThings.com. The long-awaited hub is priced at $99, the same price as the original hub but the new hub is packed with extra features like battery backup and the ability to work locally as well as in the cloud. If your power fails, you’re good. If your internet fails, most of your smart things will continue to function. From a home security perspective, this is a huge improvement. In addition to battery backup (10 hours) and the ability to work out of the cloud, SmartThings has added video support in beta. The catch on the cameras? Right now, SmartThings is only supporting Samsung and D-Link cameras but I expect that list to grow as they move out of beta. Another announced change is the size and shape of the devices. The new SmartThings’ devices are said to be thinner and sleeker than the original devices but everything looks bigger to me. Sure the top piece of the contact sensor (pictured below) is a little smaller but I wouldn’t call the device sleeker. 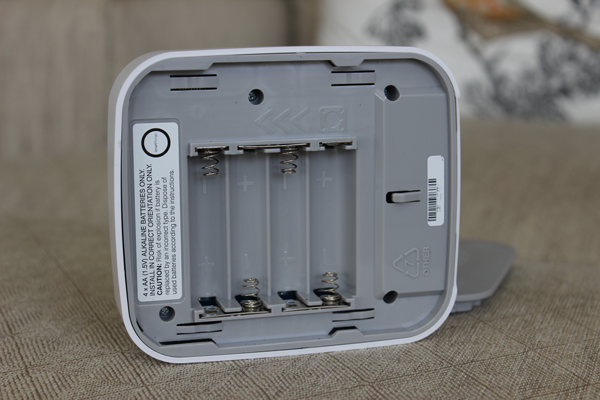 Also, the hub has a slightly larger, boxier shape to accommodate the batteries. The new hub has a little more power under the hood than version 1. It supports Zigbee, Z-Wave, and local internet connected devices like the old hub but unlike the old hub it includes 2 USB ports and Bluetooth to prepare for future expansion. Right now Bluetooth is deactivated but it’s nice to know the hub is future ready for when SmartThings wants to connect with Bluetooth ready devices. 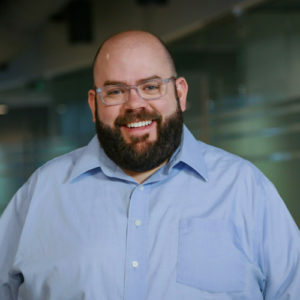 Though it’s third on my list of new things, connection to Amazon’s Echo was actually SmartThings’ first major announcement after the launch of v2. Through Echo, you can voice control almost anything connected to your SmartThings’ hub. For example, speak the words “Alexa, turn on bedroom lights” and Echo will tell SmartThings to turn on your bedroom lights. I’ve been testing this setup for a few weeks and it works beautifully. Though professional monitoring isn’t specific to v2, it is a new feature. Through a partnership with Scout Alarm, you can add month-to-month professional monitoring to your SmartThings’ system. Scout Professional Monitoring is available to SmartThings customers in beta for $19.99 per month. This price includes 24/7 monitoring by a UL listed facility. If an emergency event is detected, they will call the police on your behalf. In addition to hardware changes, the SmartThings’ App has received a much needed facelift. The new app has already launched for Android and iOS users with updates for Windows phone, Apple Watch, and Gear S coming soon. Unfortunately, getting things done in the new app is still confusing. The app now has five navigation buttons across the bottom of the screen. One for your dashboard which has smart home monitor, one that shows an overview of your everything, one that shows routines, one that shows notifications, and the marketplace button. It’s a hot mess and it is not easy to make things happen. The dashboard contains Smart Home Monitor which is a major addition to the new app. In theory it works much like most of my home security apps. I can set up different security events and attach different devices to those events like flood sensors to monitor for floods and contact sensors to monitor for break-ins. I can then setup notifications to let me know if things get crazy at home. From the primary page you can arm your system, disarm it, or arm (stay). That’s all fairly self-explanatory, right? Swiping right will let you check out the status of the devices you specifically assigned a home security chore, swipe again to see a list of home security incidents. In some ways this one section is an app unto itself. It is the central hub for those that want to use SmartThings as a home security system. SmartHome Monitor will also enhance the connected camera experience. If you have a connected camera, you will receive alerts with a video clip when events are detected. The hub will add extra intelligence by buffering video on your behalf which means that you can receive footage that includes a clip that shows what happened BEFORE the event was actually detected. As mentioned above, the beta program currently supports cameras from Samsung and D-Link. Not surprising as Samsung owns SmartThings but it would have been nice to have more options like Nest Cam. As awesome as all of this is, there is a catch! Though most of the Smart Home Monitor features like live streaming are free, unlimited video clips and other premium features will only be offered to those who subscribe. The cost is $4.99 per month though it will remain free through the end of 2015. This cost covers an unlimited amount of clip storage. For added privacy, the data from the cameras is kept locally until there is an incident which means that the v2 hub is required to take advantage of this feature. To sum up tab two I would say that where the Dashboard is like one app for home security, this section is like one app for home automation. From here you can click through to edit devices and rules. It is also where you can spy on your entire ecosystem. You can check out your rooms (foyer, living room, bedroom, etc), your things (connected devices), SmartApps (rules for devices), and your family. Ahhhh family. Family was another sore spot for me. For the life of me I couldn’t figure out how to add other family members. I tried to add others to my account but kept getting an error message stating the feature wasn’t available yet. Did I ever figure this on out? Nope. Still working on it. From what I’ve read elsewhere this feature is coming soon. In theory I should be able to add family members so I can see who is home and who is not. The routines screen is a separate area altogether. Here you can create different scenarios such as Good Morning, Good Night, Goodbye, and I’m Back! This goes beyond the home automation rules you can assign in the second tab. Basically it is a way for you to group different rules together. For example good night might lower your home’s temperature, turn off the lights, lock your front door, and close your garage (though I hope you already did that). The fourth tab, notifications, is the most straight forward of all the tabs. It shows exactly what’s been happening in your home. The messages side shows your device status such as “front door open” where the activity feed gets more into the nitty gritty showing you things like the last time you ran a search to include a new Z-Wave device. The final tab is the marketplace tab. From the marketplace tag you can try to connect new devices, buy recommended devices, view instruction manuals, and check out recommended SmartApps. You can browse the market place by things or by SmartApp. Are you overwhelmed by my explanation? So am I. Trust me. So am I. And there’s even more to the app. However, we can’t move on without talking about Smart Lights. Smart Lights was an announced new feature of the new app. It is said to be one interface that allows you to automate lights and switches based upon events. The functionality was included in the old app, but the update is intended to simplify the process. Did it work? No. No it did not. For example, I set my lights to turn on at sunset but I wanted to turn them off at 11pm. I am embarrassed to admit that I couldn’t figure it out! The only thing I could figure out was how to turn them off at sunrise + or – a set amount of time so I set them to turn off at sunrise minus 420 minutes which is a convoluted way to approach the process. I don’t feel qualified to write about my experience migrating from version 1 to version 2. Why? Because I failed miserably and how can I explain something that I couldn’t even figure out myself? I can’t. So I have to stick with writing about my experience. I decided to do a clean migration. Basically I wiped my first generation hub clean. In my opinion this is the best way to do it as your smart devices can only have one master. The best way to wipe clean? One rule at a time. Once you’ve uninstalled all of your SmartApps, uninstall all of your routines, and then all of your devices. To wrap it all up you will need to delete your current location and unplug your old hub. Once that’s done your app will reset and you can plug your new hub in and start from scratch. The best instructions I’ve found for the process are here. Once your new hub is plugged in, you start all over again. In fact, I’m not really sure why they call it a migration. It’s not a migration, it’s a rip and replace. Everything has to be completely built from scratch. And it’s time consuming and frustrating and I may have gotten in one fight over a battery or something. I’m not really sure. It was an emotional two days as reconnecting old Z-Wave devices to the new hub is more difficult than connecting new devices to a new hub. With new devices you pull the tab and voila! The device meets the hub and they fall in love. But with old devices, there’s no love. To start you must reset the old device depending upon the reset process and sometimes you have to do that 2 or 7 times. Yes 2 or 7. In my case, I have two devices that I could not get to connect to the new hub. I have 3 GE Link bulbs and could only reconnect 2 of the 3. I also have an Ecolink tilt sensor that I could not get to reconnect. Part of the problem is that the devices need to be in range of the hub but many of the devices I’ve installed are immobile and far away. Your options are to buy a massive Ethernet cable and carry your hub around the house or to bring the devices to the hub. Neither situation is ideal. Oh … if you need help, which I did, SmartThings suggest you reach out to their support team. Keep in mind that it took several days for a response which slows down the already slow migration process. SmartThings is still my favorite home automation hub. Setting everything up is a pain but once you have everything set, it works. Isn’t that the point of automation? To have a device that does all the work for you? With my previous SmartThings’ hub, all of my rules ran automatically and I rarely had to interact with the app unless I needed to make a slight adjustment here or there. I expect the process to work the same with v2 and so far it’s met my expectations. Battery backup works, the rules work, and the hub works. In the end, there’s no reason not to buy version 2. It’s the same price as v1 with more features. However, if you are planning to migrate, be prepared that the process is the same as starting over…but worse. You can order your own SmartThings’ hub from Amazon. The hub works in the US and in Canada with international expansion coming soon (UK and EU). Why can they not include export/import functionality? Homes are growing exponentially with smart home devices. Providing a means to upgrade frustration free would only boost sells on their new hubs. Dosen’t sound like v2 is worth the headach at the moment.